Plot - Fate brings two people together five years after their relationship ended. With change in circumstances, will they will be able to amend their relationship and fall in love again? A successful actor known as the Prince of Pop Music, Su Xingyu meets her ex-lover Tian Xin five years after they separated. Tian is an assistant in the same company that has signed Su Xingyu. This romantic drama explores the turbulent past between the two souls and their attempt to rekindle their long lost love. Will they succeed or will fate again crush their hearts? 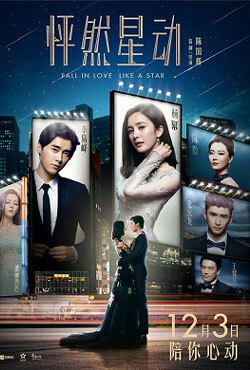 Box Office Earning of "Fall in Love Like a Star"